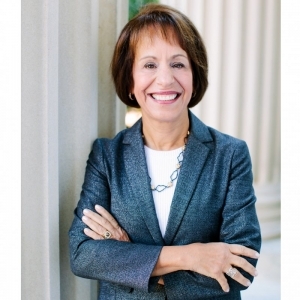 In a short telephone press conference Tuesday morning, UNC Chancellor Carol Folt denied tensions with the UNC Board of Governors over the “Silent Sam” Confederate monument led to her announcing her resignation this week. “I have not wanted my job status to be part of the decision making about the monument and it hasn’t been,” Folt told reporters Tuesday. Her decision to order the removal of the base of the statue – which was toppled by protesters last year – came in the same Monday statement in which she announced her resignation. Both moves blindsided the UNC Board of Governors, according to Board Chair Harry Smith. But after nearly six years as chancellor, Folt said, she had been considering her next steps for some time. The tension with the board over the statue and her resulting order, which infuriated some of its members, happened at the same time she made her decision but weren’t directly related, she said. After touting her accomplishments as chancellor since 2013, Folt deflected questions about her tensions with the UNC Board of Governors and rejected the notion that she should have acted more quickly and decisively on the divisive monument. Asked whether she had waited too long to develop moral clarity over the statue and the necessity of its removal, Folt said she believes her moral position hasn’t changed. She was simply looking at the problem for a legal perspective and constrained by a 2015 state law protecting such statues, she said. With the statue’s toppling and continued examples of its danger to campus safety, she said, the way the problem was approached had to be changed. Last month Folt and the UNC Board of Trustees delivered a report to the board of governors in which a panel of security experts concluded the statue should not return to campus. Prominent members of the board of governors disagreed, with Smith saying the law left no other option. The board of governors is meeting in an emergency closed session teleconference at 1 p.m. Tuesday to discuss Folt’s resignation announcement. Asked if she thinks they will fire her or ask her to leave before the end of the semester, Folt said she couldn’t speculate – but she hopes not.